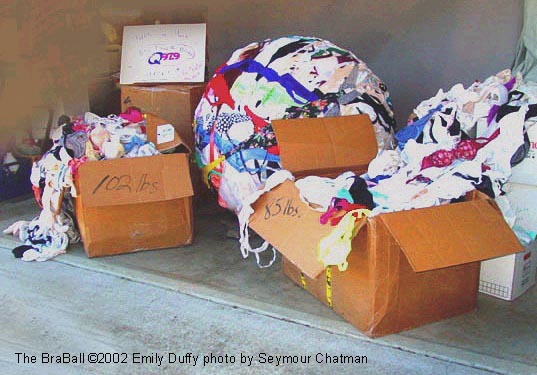 On Tuesday, November 26, 2002, I received three crates weighing almost 300 pounds total, and bursting with bras, from radio station WJBQ ("Q97.9") of Portland, Maine. In October, 2002, the station held an event called "Bras Across the Bridge." Listeners donated 2,700 bras, which were hooked end-to-end and strung across the Casco Bay Bridge. The event also raised over $7,000 for the Maine Cancer Foundation. After their event was over, a staff member of the "Q Morning Show" contacted me about donating the bras to The BraBall project. Needless to say, I was thrilled. This is the largest single donation ever received for The BraBall. Thanks so much to the staff at WJBQ, their generous listeners, and especially Lori and Neil, for their "support."